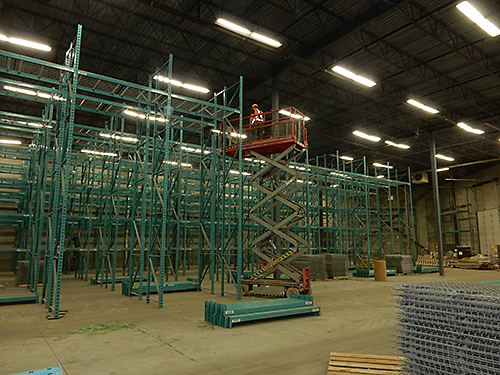 Rack Buy-back – Canadian Rack Inc.
Sell Your Pallet Rack And Other Material Handling Equipment To Us! Big or small, we’re interested in it all. We buy used pallet rack, storage systems, industrial shelving, and many other types of warehouse and material handling equipment such as cantilever rack, forklifts, rolling ladders, pallet trucks, dock plates, dock boards, industrial scales, shop carts, work benches, security cage / wire mesh partition, lockers, fire cabinets, wire mesh deck and much more. Are you closing down a warehouse, distribution center or factory? Are you a trustee, or a landlord looking to clear out a warehouse of all the warehouse equipment and in some cases inventory left behind by a tenant or bankruptcy? We will come in and inventory the items you have and offer you a fair value for everything, and we will provide our own professional and efficient work crews to dismantle your storage systems and remove any other items needed.